When we dined out recently (Mesa de Notte, Ocala, FL, mesadenotte.com), we were pleasantly surprised by the wine list. 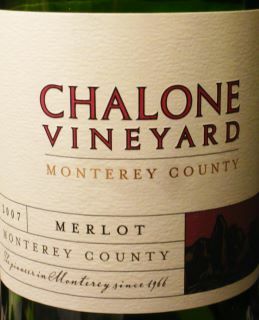 In fact, TWO Chalones (Merlot and Chardonnay) were on the wine list, along with a Cloudy Bay Sauvignon Blanc from Marlborough, NZ. The Chalone Chardonnay was sent to Paris in 1976 (See Judgment of Paris, George M. Taber) and was judged third in that history-changing competition/wine tasting. Cloudy Bay was written up in Taber’s book as well, as one of the leading winemakers in one of the finest wine-growing areas in the world. So we leaped at the chance to try a Chalone, especially with its $26 price tag. I mean, in a RESTAURANT? A great wine at a great price doesn’t happen very often. Sure enough, it’s available for an average of around $12, and for as little as $7.34 online. Run, do not walk. This wine had a gorgeous, classic, elegant nose from the get-go. Laced with oak, it had beautiful cherry aromas and subtle baking spices. Interestingly, its taste was softer, so much so that we were afraid it wouldn’t stand up to our courses (Caesar salad, veal saltimbocca, eggplant parmigiana, zabaglione with wild berries). Fear not—this beautiful wine rose to the occasion and neither overpowered nor cowered next to any of these diverse courses. With subtle hints of clove and allspice, it is smooth, velvety, round, and well balanced. WEB NOTES: Chalone Vineyard is the sole winery in the Chalone American Viticultural Area (AVA), a federally designated area that has climatic, geologic and geographic features that distinguish it from the land surrounding it. Dramatic climate changes occur at Chalone Vineyard not only from season to season but hour to hour. Temperatures can swing from intensely hot during the day (90 degrees F) to considerably cooler at night (50 degrees F) over much of the growing season. Grapes need these cold nights to maintain their acidity while fully developing their flavors. The appellation is dry, with an average rainfall of less than 15 inches annually. Terroir may not be tangible, but its presence is undeniable in the wines of Chalone Vineyard. A French word that has no direct English translation, terroir can be loosely interpreted as a sense of place conveyed through wine. The idea of terroir encompasses not only the soil but also the subsoil, drainage, degree of slope, soil temperature, orientation to the sun and the influence of climate on all of these factors. These environmental elements combine to produce vividly flavored grapes and wines with pronounced varietal character, a great deal of complexity, and a pronounced terroir. Our vineyard’s soils are quite unusual in that the limestone deposits are interspersed with decomposed granite and moderate amounts of clay. The limestone base causes the vines to struggle, which limits their vigor and packs more flavor into the grapes. The overall soils composition produces minerality and brioche flavors in our wines. The structure of the soils influences drainage and helps create homogeneity of ripeness. Decomposed granite, which has very little water-retaining capability, further reduces vigor. We conform to the Burgundian concept that great vineyards are naturally low-vigor and have small crop loads. The ability to achieve true ripeness coupled with minerality and limited vigor defines Chalone Vineyard’s terroir and viticultural area. LABEL NOTES: Our Merlot is soft yet full-bodied with rich cherry flavors and aromas, enhanced by hints of oak vanilla. At Chalone Vineyard, we believe that great wine comes from great vineyards. This Merlot is sourced from the southernmost part of the Monterey region, where the warmer temperatures moderate the cool Pacific breezes. As the pioneer in the Monterey wine region, we bring you great wines that reflect the unique characteristics of Monterey County vineyards. This entry was posted in Books, California, Merlot. Bookmark the permalink.